Mem Miller and Jonathan Miller were asked to participate in the Small Business Administration’s Mentor Month kickoff event for the Pittsburgh region. Mem was a member of the Entrepreneur Panel and Jonathan delivered a talk about the importance of building a business that ‘works for you, then others’. Mem, Jonathan, and the other entrepreneurs at the event strongly advocate asking for and providing mentorship within the entrepreneurial community. 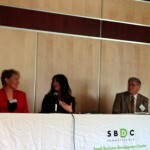 Dimples Co-founder Mem (in red) participating in Western PA SBA Mentor Month kickoff. 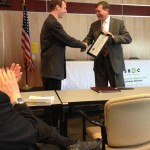 Jonathan, Co-founder of Dimples, receiving Young Entrepreneur of the Year award from a County Commissioner.